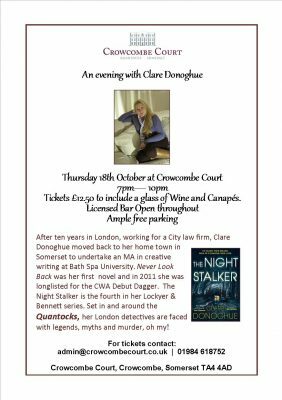 Join us for a glass of Wine and Canapes followed by an entertaining talk by Clare Donoghue. After ten years in London, working for a City law firm, Clare Donoghue moved back to her home town in Somerset to undertake an MA in creative writing at Bath Spa University. Never Look Back was her first novel and in 2011 she was longlisted for the CWA Debut Dagger. The Night Stalker is the fourth in her Lockyer & Bennett series. Set in and around the Quantocks, her London detectives are faced with legends, myths and murder, oh my! Clare will be signing and selling copies of The Night Stalker during the evening.